Want to wrap your head around SEO, but getting scared off by technical terms and complex concepts? This friendly article walks you through everything you need to know to start ranking in Google. Here’s a fun perk of working in the SEO industry—people always ask me some variation of this question. When you’re good at SEO, your website gets on the first page of Google. It’s as simple as that, and it is cool! When I first started learning SEO, I was very nearly frightened off by terms like crawlers, backlinks, anchor text, nofollow vs. “dofollow,” white‐hat vs. black‐hat… the list goes on. The industry seems to be plagued with technical jargon and complicated concepts, to the point where people struggle to understand what needs to be done. Sounds like you? If so, you’re in the right place. I’ll be preparing you for your first steps in SEO, all with explanations and language that are easy to understand. What are search engines, actually? What’s the big deal with Google? What makes it different from Yahoo and Bing? Also, what manner of creatures are Naver, Baidu and Yandex? Essentially, what search engines do is collect information and content from all over the web and store it in a database. According to a November 2018 report by netmarketshare, 73% of all searches are powered by Google. In second place is Bing with 7.91%. An almost shockingly huge difference, yes. So… what exactly makes one search engine so different from another? Specialization in market/type of content. In short, it’s proven itself to be by far and away the best at answering peoples’ queries with appropriate content. It’s now pretty much the way everyone in the world–except China–finds stuff online. Of course, more specialized search engines also exist. Naver, Baidu and Yandex are examples of search engines that target specific markets–Korea, China and Russia respectively. Fun fact: YouTube is also a search engine! So we know who the biggest player in the game is; now we need to know how it works. Here’s a simplified version of the entire process of search, split into three parts: crawling, indexing and returning queries. Or, in plain English: finding pages, storing them and then showing them to searchers. Imagine that you need to explore an unknown country. You start in a small town and drive down a road that connects you to the next town. You take the next road to the next town, and the next road after that. If you drive down every possible road from your starting point, you’ll eventually end up discovering every town. This is how Google works–except the towns are web pages, and the roads connecting them are backlinks. So: Google first starts with one webpage. It finds the links on these webpages and follows them to discover other webpages. It then finds all the links on those pages, and the next pages, and the next. Eventually, they’re able to discover pretty much everything on the web. And how does Google do this? It uses a computer program that’s commonly referred to as a crawler to “crawl,” or discover, pages and links. Crawlers are sometimes also called “spiders”–because they, too, crawl the web. In SEO, we want to do everything we can to make the spider’s job easier. This, in turn, makes it easier for our webpages to get crawled. After finding pages on the web, the spiders then extract data from them and store, or “index,” said data in Google’s database—to then be shown in search results. Here’s the fun part: spiders don’t actually view webpages the way humans do. That’s the kind of data spiders collect and store: the date a page was created, its title and meta description, main keywords, links to and from it and other details specific to that search engine’s algorithm. Try it out for yourself—think of your favorite website, then enter it into this page to see how it looks to a spider. Pretty different, huh? In SEO, we want to ensure that the data that Google indexes after crawling our pages is as accurate as possible. This makes it much more likely that they show up in search results where we want them to. When you enter a search query into Google, it searches in its database for the webpages that are most relevant to your query and displays them as search results. This relevancy is determined by its algorithm. The number of quality backlinks to the target page. Google places strong emphasis on backlinks as a form of authority and relevance. Even as a beginner, there are thankfully plenty of ways you can get yourself ahead of the game when it comes to backlinks. We’ll cover this a little later on. Now we know that web pages need to be crawled and indexed. Which brings us to the big question: what do we do to help this process along? And when it comes down to it…just what are we optimizing in “search engine optimization”? The answer can generally be split into two categories, namely on‐page and off‐page efforts. On‐page SEO is all about adjusting elements on a webpage so that Google understands what it’s about, recognizes how awesome it is and decides that it deserves to be #1 in search results. Generally speaking, the more and better quality backlinks you have, the more your pages are prioritized in search results. We have Google’s algorithm to thank for this. Don’t worry; you don’t have to wrap your head around everything right now. Here’s a 7‐step tutorial you can follow along with easily which incorporates both elements mentioned above. People search for your brand or business in tons of different ways. Although they’re all phrased differently, they’re essentially asking the same thing. You have two options: guesswork, or keyword research tools. Google Trends is one good (and free‐of‐charge) option that shows you the relative popularity of any search queries you enter. One caveat: while it’s great for tracking trends, what Google Trends doesn’t do is show the search volume of said search queries. 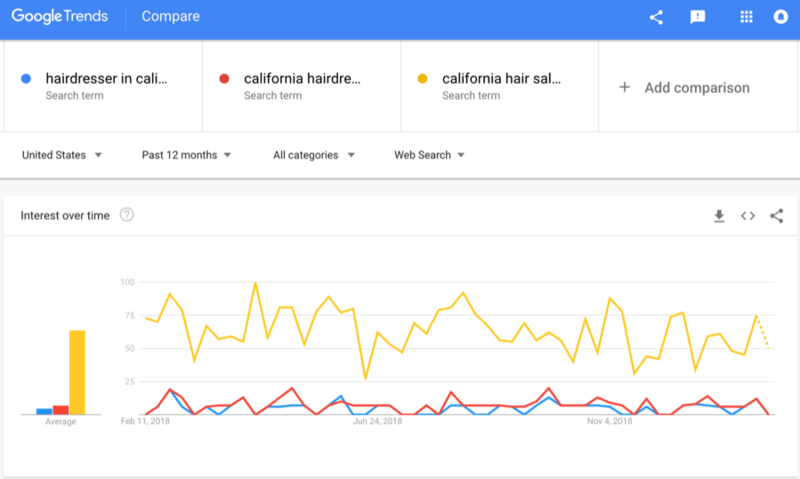 So while we can see that “California hair salon” is clearly the winner here, it could, in reality, get four searches a month while the other terms get one. In which case, none of them would be considered to be popular at all. Take your best guess at a search term and enter it in Keywords Explorer. Let’s try “California hair salon” in this case. From here, look at the “parent topic” feature that takes the #1 ranking page for your keyword and shows the best keyword that this page ranks for. There we have it: salon California! 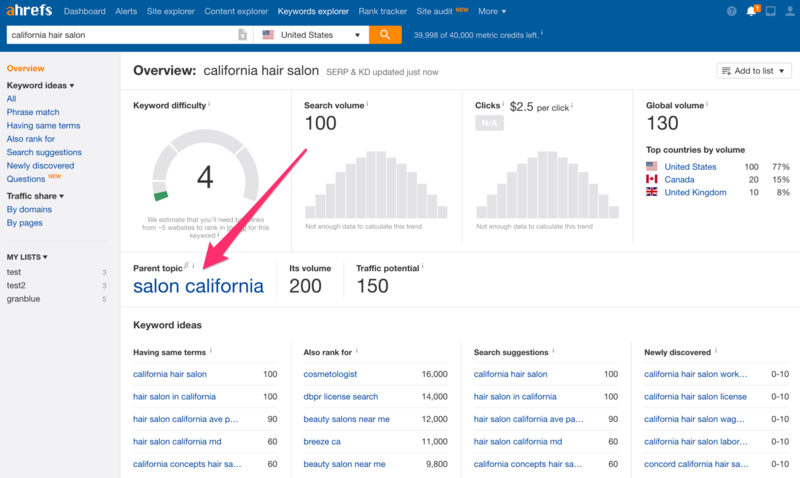 Now that we know what people are searching for, we can either create content on our website around “salon California” or modify existing content to fit these keywords. Important: Keywords should always be chosen on a page‐by‐page basis. For example, if you sell multiple products or services, you’ll want to target different keywords for each page. Google ranks webpages, not websites! 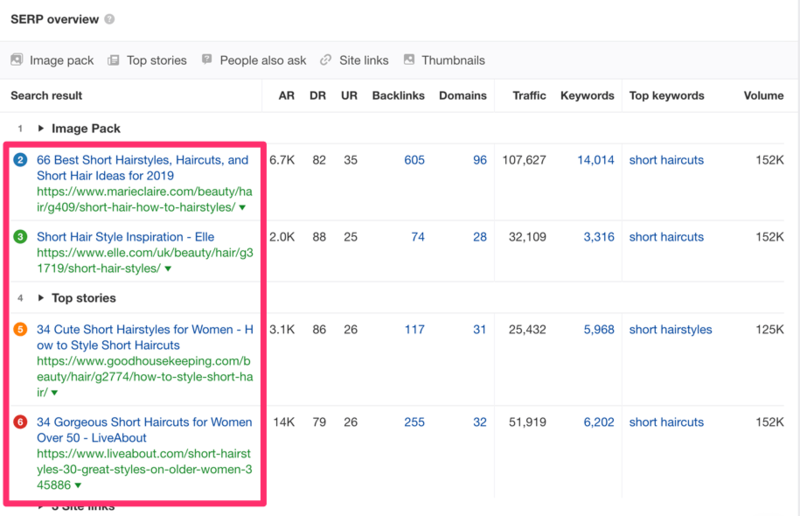 Also remember that in general, it’s not a good idea to blindly target broad, sweeping queries like “hairdresser.” Not only is competition nearly impossible to beat, but it’s also difficult to figure out search intent. Here’s the coolest thing: we don’t actually have to guess search intent. Since Google’s algorithm already works to serve the most relevant content for each search query, we can use this to our advantage. Just look at the existing top results to figure out what people are looking for. Think about our topic of hairdressing. I can’t figure out what people want to know just by looking at this term on my own. Do they want to know more about hairdressing techniques? Do they want to find a good hair salon? 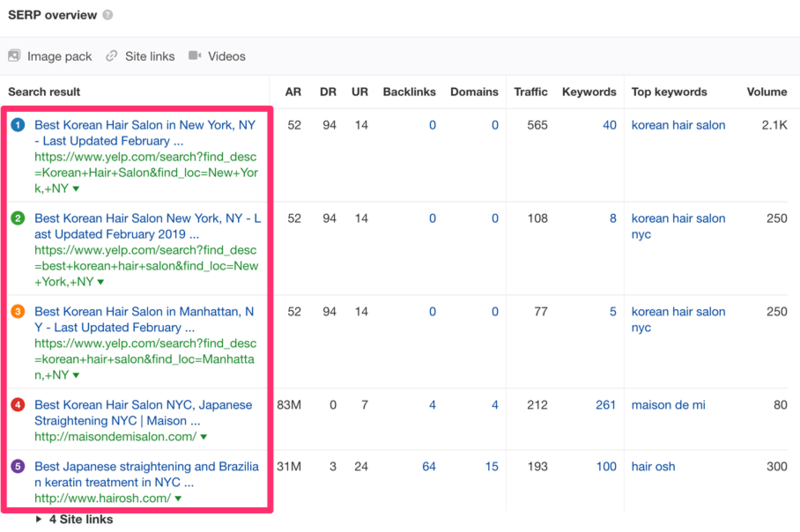 We can check this in Google by typing in the term (note that the results are automatically localized to your country), or in Ahrefs’ Keywords Explorer—simply scroll down to “SERP overview” to see the top results for your keyword. Putting Yelp’s dominance aside, individual salons are also ranking here. Seems like that’s what people want. 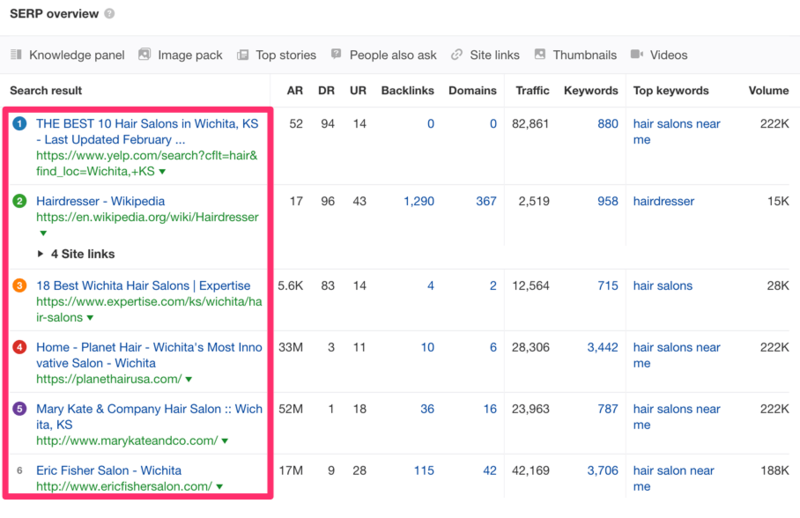 Some of the results are hair salon websites; some are blog posts. One is even from Wikipedia. And the others are definitions. Search intent is all over the place, so we have no idea what searchers want here. 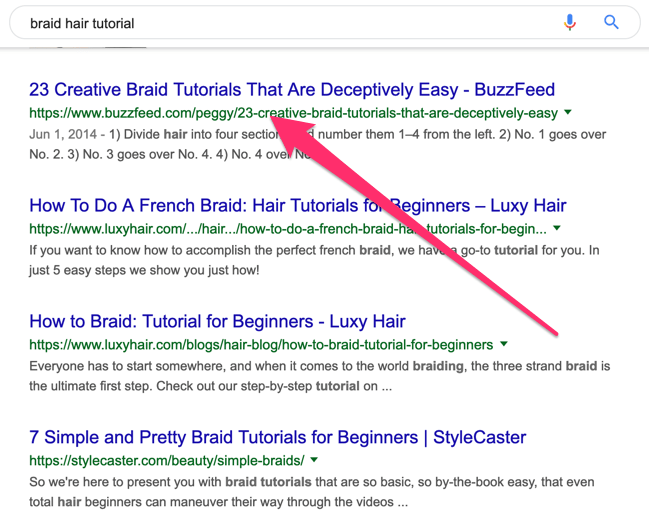 Remember when we talked about how you shouldn’t target broad, sweeping queries like “hairdresser”? This is further proof—in general, the less focused a query is, the less clear search intent is likely to be. Bottom line: Spend some time analyzing search intent, and make sure you give people what they want to see. We’ve talked about how to rank a webpage for popular keywords. But you don’t just want to rank, do you? Searchers should actually click into your webpage. So: make your titles (and descriptions) as click‐worthy as possible. Make your content scream “CLICK ME” in the search results! Personally, that first result would definitely get a click from me. Not 1, but 23, tutorials which are creative AND easy‐to‐do? Count me in. Unfortunately, there’s no exact science to writing compelling title tags and descriptions. It’s really about understanding your target audience and knowing what matters to them—then crafting a title which gets them to click. Stay true to search intent. Don’t forget the previous step and stray too far! Avoid truncation. Google cuts your title off with the dreaded ellipses (…) if it gets too long, which hurts your click‐through rates. Use this tool to check that it falls within limits. Include your unique selling point. Sell your brand, whether it’s “free delivery”, “est. 1975”, “only uses fresh milk from Hokkaido”…you get the gist. Include your keywords if possible. Prioritize keeping your title natural‐sounding and avoid keyword stuffing. Be honest; how do you feel about this description? “We’re a hair salon in California with the best hairdressers in California. Looking for a California natural hair salon? We are one of the leading organic hair salons in California.” It sounds unnatural, right? 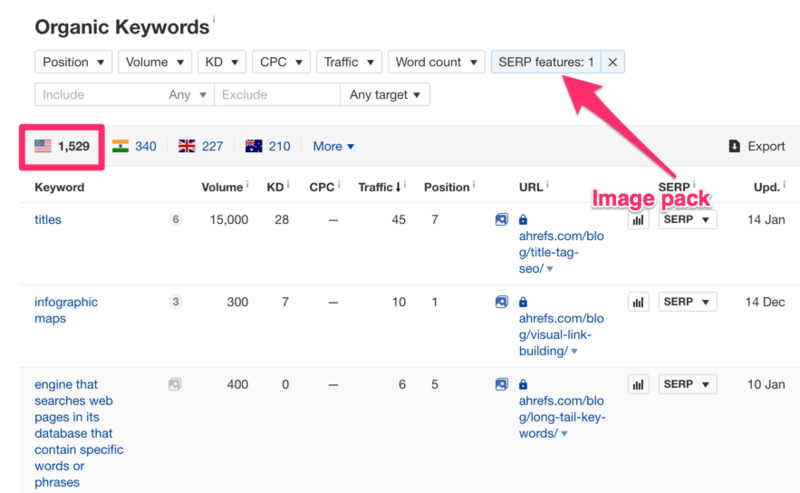 Which one includes the keywords you’re looking to target with this article? Which one are you more likely to click on in the search results? Keep your URLs as short and sweet as possible. The collective sanity of internet searchers thanks you. It can be a little tedious, but make sure to name all your images appropriately. In the same vein, optimize all your images by including alt tags with descriptions. This is the text that shows up whenever your image fails to load or if the user is using a screen reader. Remember how we discovered that spiders don’t “see” images on pages the way we do as humans? Naming them helps Google to understand the images better. This traffic actually adds up over time, too! 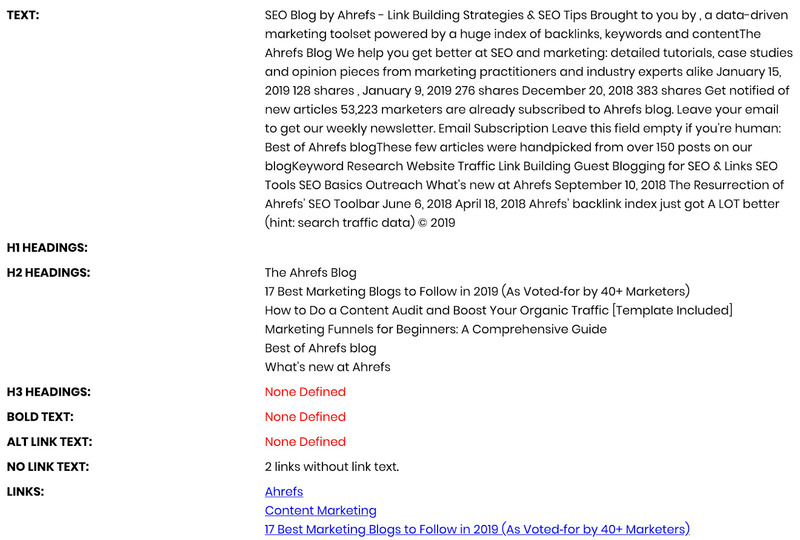 Here, I plugged the Ahrefs blog into our Site Explorer and used the SERPfeatures filter to check how many keywords our images rank for. That’s a total of 1,529 keywords. While they’re unlikely to be a huge source of organic traffic, it’s definitely traffic that’s welcome. Also, do your best to keep your image sizes as low as possible. You can use free tools like Imageoptim and Shortpixel to do this. It’s widely believed in the SEO industry that user signals influence rankings. Do your best to optimize things like your title and image tags—but keep in mind that user experience is also important. If your content is difficult to read and digest, readers are going to leave (and for good reason). Start using <h1>, <h2> and <h3> tags in your webpages. Think of these as a hierarchy for your content, with <h1> being the most important (and only used once per post), and <h2> being a subheading. <h3> is a subheading of <h2> and so on. H2: Why are ponytails so great? Place your keyword within these header tags strategically, but make sure they sound natural—avoid keyword stuffing. Use formatting like paragraphs, bolding and lists to break up big chunks of copy. Don’t use big words—write how you would speak to a friend. So instead of using “feasibility,” use “chance.” Writing is about communication, not about making yourself look smart. Tools like Hemingway help to analyze your copy and check if it can be easily understood. Include images (with alt tags, wink) to better illustrate your points and break up walls of text. Note: Many of the above tips were heavily condensed from our original guide to on‐page SEO. Head on over for more in‐depth strategies. Backlinks are very, very important. Let’s start by breaking it down a little. Firstly, what’s a backlink? It’s an incoming hyperlink from another website, or referring domain, to your target webpage. In plain English, when another website links to you, it’s giving you a backlink. 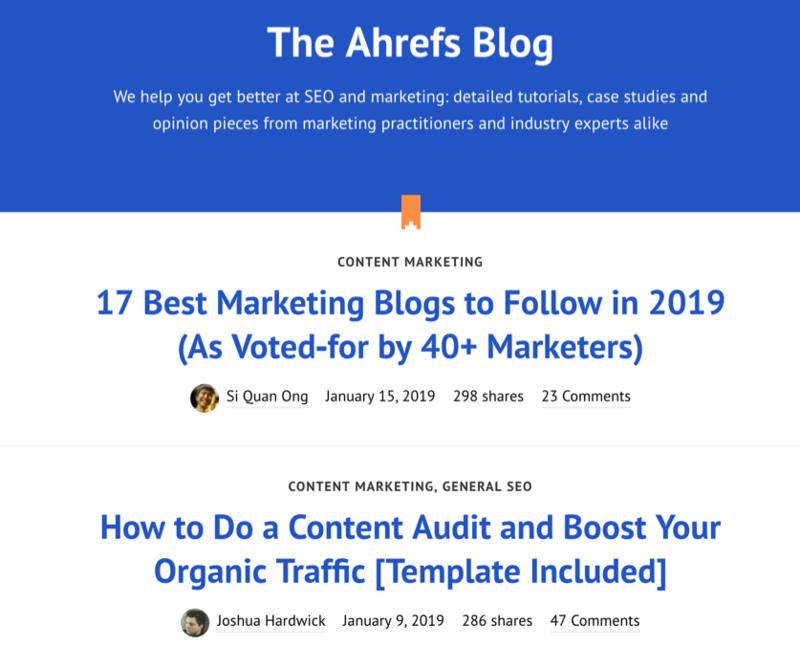 For example, this is a backlink to the Ahrefs Medium account. In general, any SEO will tell you that the more and better quality backlinks you have, the higher your chances are of ranking a page and the more search traffic you’ll get. 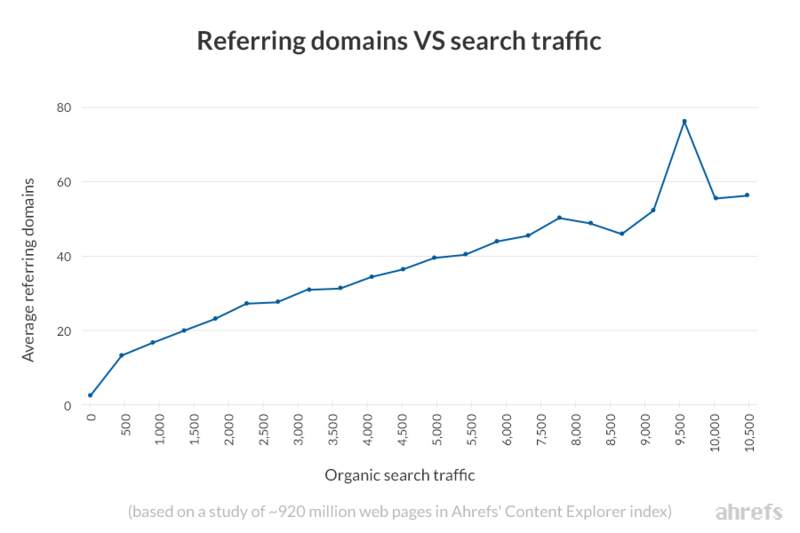 Findings from our study of almost a billion webpages support this as well: we found a linear correlation between the number of referring domains and search traffic. Correlation does not prove causation, which means that this is not direct evidence that links help you rank in Google. So, how do you build a backlink? 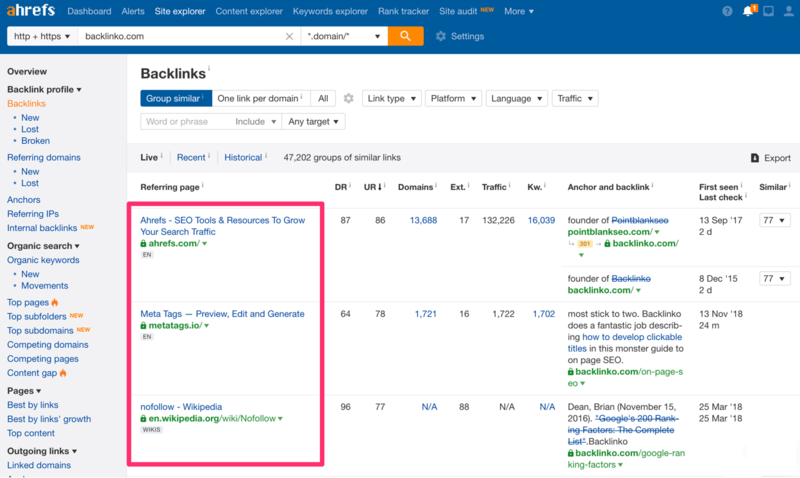 There are tons of tactics and strategies: guest posting, broken link building, or even researching your competitors’ backlinks and trying to replicate them are some. Sounds interesting? We have an entire guide on looting your competitors’ backlinks. Get links from people you already have a good relationship with. 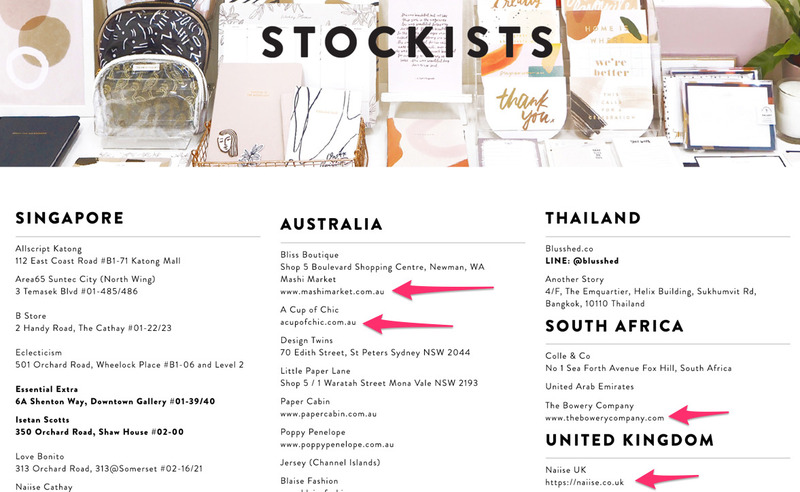 Think about everyone you already have a connection to through your business: partners, stockists, suppliers, clients, agencies. 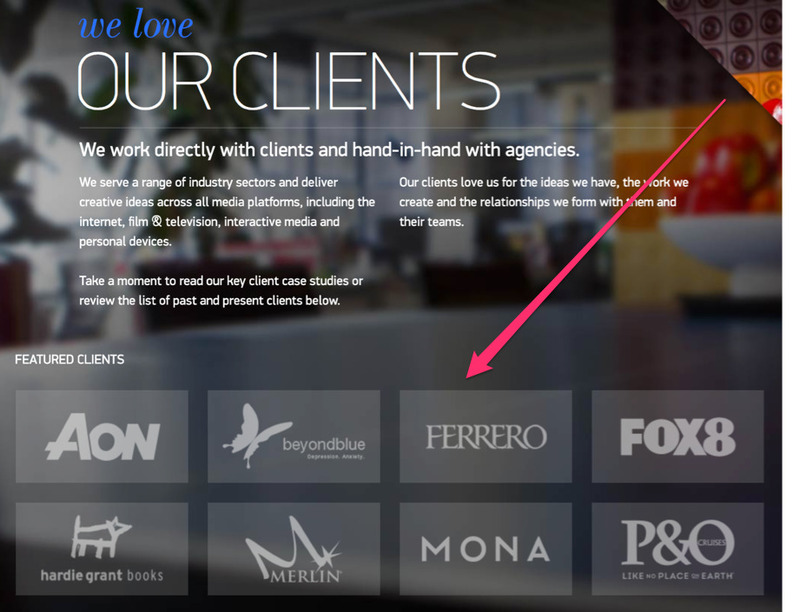 Plenty of brands link out to others on their websites. You just need to reach out and ask. Make a list of all relevant companies that might give you a backlink and start reaching out! As always, be gracious: ask nicely and don’t be a jerk if they refuse. There we go—that was a really simple link building strategy you can try right now. Not so scary, right? When it comes down to it, getting backlinks is as easy as finding webpages where your link will add value, then getting a person who can edit the page to add it. With that said, we’re obviously barely scratching the surface of the art of backlink building. Some great places to get learn more: head over to our in‐depth easy link building tutorial, or dive into our YouTube tutorial on how to get backlinks super fast. SEO is a marathon, not a sprint–you’re playing the long game. It’s not about a one‐time optimization of five existing pages and never looking at your website again. It’s not even only about planning and creating evergreen content that will get you steady amounts of passive traffic. These days, SEO seems to be everything at once, from optimizing pages for search engine readability to creating content that’s a perfect match to searchers’ needs. Industry experts even seem to be in agreement that the definition of SEO itself is evolving. Once upon a time, the most in‐depth SEO strategy involved stuffing a post chock full of the same keyword so that Google would associate said keyword with the page. Clearly, those times are past. Perform content audits every so often to optimize your existing content. It can be very overwhelming to try and get everything right at one go, so my advice is: don’t bother. Pick the area which suits your resources and aligns with your own skills the most. If your existing team doesn’t have content creation abilities but love to network and do outreach, look at backlinks instead. Start off by trying to build one backlink through any strategy at all. Then build five more. Then aim for twenty. By the time you decide to invest in content creation, you’ll have a website with a much stronger backlink profile to send those awesome authority signals to Google. Start off small and expand from there. You’ll learn the skills needed and figure it out as you go. We’ve just about covered the basics, I think! That was quite a bit of information to get through; I’m glad that you made it all the way to the end. Where to go from here? I highly recommend checking out the other articles on our blog for a ton more in‐depth strategies and case studies. If you’re so done with reading right now and would prefer to switch to video, we also have lots of step‐by‐step tutorials and guides over at our YouTube channel. Hopefully, this post gave you enough background information as well as actionable tips to get started on your SEO journey. I’d love to know if it did, and how you progress from here on out.